I decided the video needed to be redone because our prior tutorial only shows one step in the style and it doesn't make sense if you are watching directly on Youtube. I didn't realize back then that some of you watch our videos on Youtube itself, rather than from our website (which shows the rest of the instructions in picture form) until we started getting comments on Youtube asking us how to finish the style lol. Duh! 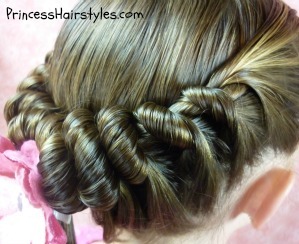 We love this style because it is so quick and easy. It's also a great alternative if you don't know how to french braid. If you can twist, wrap, and tuck, you can do this. 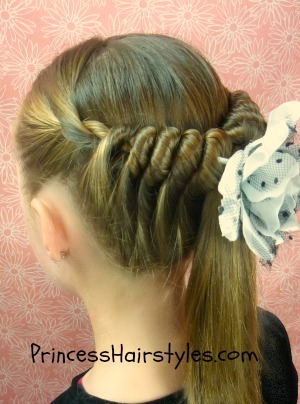 We chose to make a rope braid as the base for this style, but any type of braid can be used. This also reminds me a bit of a french twist. I have seen several hair videos and pictures on Pinterest of hairstyles which use a headband to create this same type of look, and also as a method to create no heat curls. This is the same concept, but without the need for a headband. If you are using this hair style to make curls, I would suggest either braiding the hair in the ponytail, or adding that hair into the twist (so that all of her hair will be curled) instead of leaving the ponytail down like we did here. 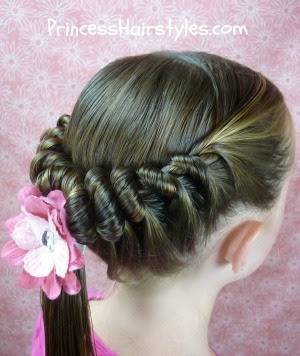 This hairstyle is versatile and can be made with wet or dry hair, curly or straight. In our video, the Princess's hair is damp. 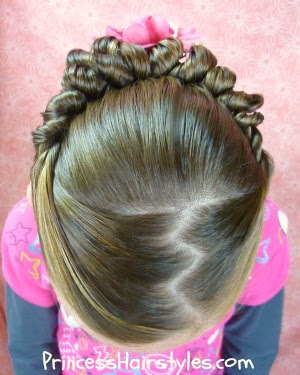 But, in the picture below, we styled her hair dry. It turns out great either way. Spiral Braid Ponytail Video: Click here to watch the tutorial directly on YouTube. That's awesome! It looks like an incredibly fancy version of a regular topsy-tail, I think it's pretty enough to wear to a wedding- I can even imagine a bride with this one. At the same time, that looks so easy to do that even I can probably get away with doing it on myself and have good results.